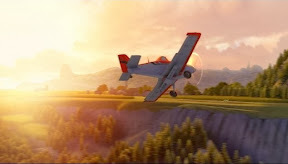 Infusing the film with personal touches to honor the wartime heroics of his long-passed Navy flyer father, it’s safe to say that director Klay Hall’s “World of Cars” spin-off Planes is a labor of love. And in easily the strongest bonus feature included in the Blu-ray Combo Pack of Disney’s latest new release, Hall’s infectious enthusiasm, vast knowledge of the subject and obvious passion for planes shines through. It’s just a shame that the movie itself isn’t nearly as engrossing as the anecdotes he shares onscreen while touring a plane museum with his sons. 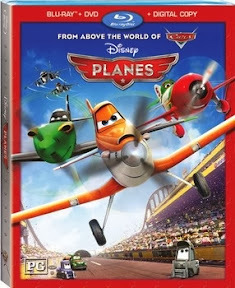 Originally slated to revolve around trains and make its cinematic debut as a direct-to-disc feature before it was transferred into 3D and released on the big screen to cash in on the blockbuster summer box-office, Planes’s overwhelming familiarity and strict adherence to the underdog formula employed in so many of the studio’s features ensures a bumpy ride. 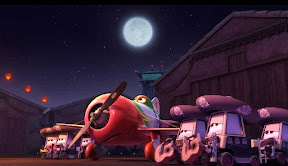 The first of a planned trilogy, while fortunately it can only improve as the series continues, unfortunately the first impression we’re left with for Planes is that it’s a virtually recycled retread of the Pixar smash which inspired it – Cars. 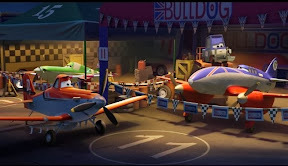 Additionally hindered by the fact that it bowed onscreen mere months after the release of DreamWorks Animation and Twentieth Century Fox’s vastly superior, topically similar underdog racer movie Turbo While the allure of Disney ensured a much bigger success given the company’s amazing track record, the novelty of Planes’s plot was lost on those who’d already seen Turbo. Centering on a likable crop duster aptly named Dusty (voiced by Dane Cook) who longs to compete in the Wings Around the World Rally despite a serious fear of heights, Planes benefits from the top-notch vocal cast that diverts us from the predictable paradigm while bringing the scene-stealing supporting “ladies and gentle-planes” to life. 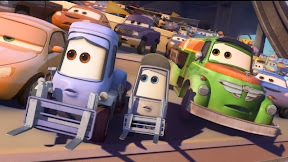 Taking a cue from the recent trend of color and ethnic-blind international casting to appeal to the hearts (and wallets) of a global box office, Cook’s predictable Rocky-inspired “vehicle interest story” themed character pales in comparison to the charm and comedic attention-commanding characterizations of Carlos Alazraqui’s cape-swishing El Chupacabra and Roger Craig Smith’s cocky champion Ripslinger. Also featuring John Cleese, Julia Louis-Dreyfus, Teri Hatcher, Stacy Keach and Priyanka Chopra, Planes makes a play for the children of the ‘80s now dragging their own children to the theater with cameos from Top Gun leads Anthony Edwards and Val Kilmer. 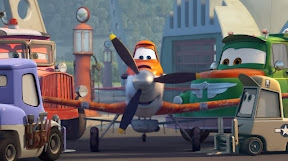 Though we can only hope that the next installment will move one of these supporting planes to the front of the runway so the series can really take off and keep us engaged, ultimately what we’re left with is a somewhat entertaining but mostly unimaginative hodge-podge of Pixar and Disney hits from years past. While some would see fit to blame the small-screen ambitions of Planes’s origin, as its screenwriter Jeffrey M. Howard has proven in the past with his stellar work on Disney’s direct-to-disc Tinker Bell series (including its strongest sequel Great Fairy Rescue), there’s no room for narrow minds regarding which audience the project was originally intended. Simply put, the only criterion for success (particularly when dealing with this market) should be whether or not you’re entertained from start to finish. And despite the cheerfully crisp, colorful animation that particularly dazzles whenever Dusty finds himself in new surroundings from the Far East or America’s east coast, most viewers big and small will find their minds begin to wander long before we’ve reached the second act. Forgetful by the time you’ve made it to the final credits, while toddlers will probably happily fly along (at least for a little while), for slightly older race fans, the best bet is to go with Turbo or perhaps hitch yet another ride with Pixar’s transporting original people-mover Cars.